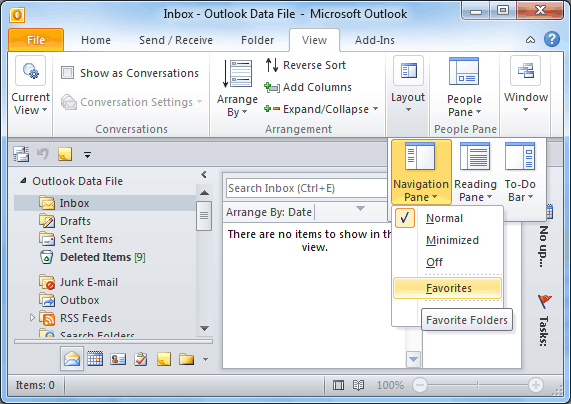 In MS Outlook 'Favorite Folders' offers a convenient way of keeping the frequently used items visible at glance. The specific folders and the unread items can be accessed quickly right from the Favorite Folders list of incorporated items. Moreover, the items stored under these folders can be arranged and re-arranged accordingly and searched quickly. Only email folders can be added to the Favorite Folders list. It will enlist main folders only while it is not possible to add subfolders to the list. Folders can be added or deleted as and when required from the list. The access to Favorite Folders can be enabled or disabled as per requirement. 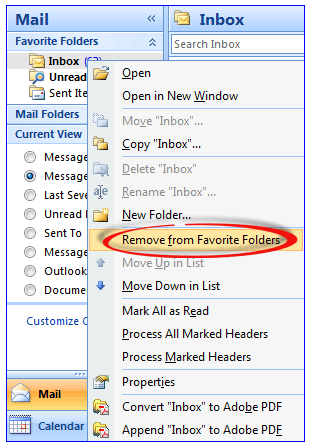 Sometimes, the Favorite Folders list gets missing from the MS Outlook interface when the application restarts. This problem might prove to be critical as these folders may contain important emails data. Therefore, it is important to troubleshoot the issue as when occurred it might continue for regular duration of time span. Troubleshoot Favorite Folders empty upon restart issue requires understanding the reasons that are responsible for its occurrence. One of the major reasons behind the persisting issue is that the Favorites section might have disabled accidently. In addition, inappropriate functionality or an issue with the Outlook profile might be responsible for the cause. If you come across this similar issue try following the given workaround procedures to troubleshoot the problem. If the issue is been occurred due to improper performance of the Outlook profile, the here mentioned work around measure can be implemented to get rid of the problem. Go to 'Start' menu and click on 'Run'. In the then appeared box, type: "outlook.exe /resetnavpane"
Click on the 'Start' menu and type the following command in the search box: "outlook.exe /resetnavpane"
Running this switch would not help getting the Favorite Folders back but it will help detecting the cause behind the issue. The detected causes can further be eliminated to prevent future occurrence of the existing issue. One of the reasons behind getting Favorite folders empty error might be the special characters that have been added to the components stored under this section. The XML file might not able to read the special coding of these characters. If the folders gets missing when the system is restarted, there may be a little or higher corruption in the mail profile used in Outlook. For this, you can try creating new email profile and sending test mail via the newly created profile. If the same issue of Favorite Folders empty upon restart continues to exist, it shows that the Outlook profile might have become corrupted. 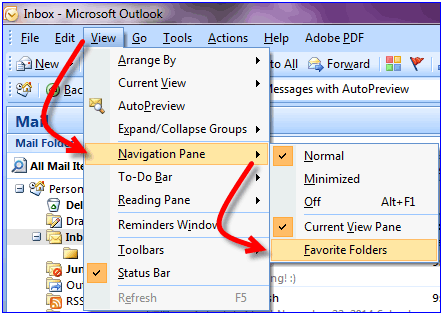 Navigation pane settings' file includes Favorite Folders and must backup on regular basis. The settings are stored in .xml file and this file gets stored with the same name as of the main profile but with .xml extension. For example: if the mail profile name is "mail", the settings will be stored in "mail.xml". The storage location of XML file depends upon the version of the Operating System. Note: These locations are hidden folders. You can copy the address mentioned herein in the Address Bar in Windows Explorer or turn "Show hidden files and folder" settings to enable mode. Go to the 'View' menu and click on the 'Navigation pane'. Click on the 'Favorite Folders' to uncheck the option. Same way, click on 'Favorite Folders' to enable the option. Go to 'View' tab, click on 'Navigation Pane' and then click on 'Favorites' to enable the option. 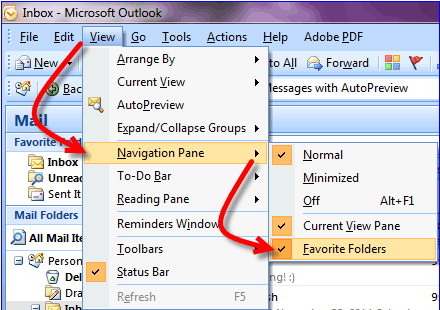 For disabling the Favorite Folders option, click on the 'View' tab and then click on 'Navigation pane', and click on the 'Favorites' to uncheck it. Go to 'View' tab and select 'Folder pane' and then click on 'Navigation pane'. Further, click on the 'Favorites' to enable the specified option. Alternatively, follow the same path and then click on the 'Favorites' to disable the option. In Favorite Folders section, click on the upward arrow sign available in the right side of the header to minimize folders. For maximizing the Favorite Folders list, click on the downward arrow sign available in the header section. This list can be removed to minimize the volume and length of the Navigation pane. Follow the under mentioned procedure to remove the folders from the respective section. Procedure: Go to Favorite Folders, right-click on the folder that needs to be removed. Afterwards, click on "Remove from Favorite Folder" from the available options. Repeat the same procedure for removing other unnecessary folders from the list. Conclusion: Favorite Folders is a useful feature offered by MS Outlook. It is important to manage this feature in order to retrieve intended advantages. Favorite Folders empty upon restart issue might prove to be annoying but this problem can be eliminated by following resolution methods mentioned in this section.